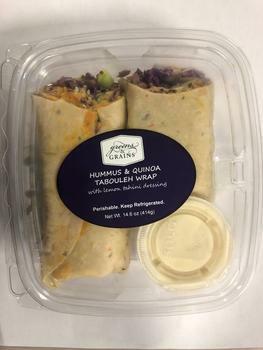 Atherstone Foods Inc., of Richmond, Calif., is recalling 14.6-oz., (414g) Greens and Grains Hummus and Quinoa Tabouleh Wraps. The recalled product, packaged in a clear plastic container, with use by date sticker of 12/19/18, was distributed in retail supermarkets throughout the Northern California Region. Customers who purchased the recalled product should return it to place of purchase for a full refund. Consumers with questions may contact the company (510) 236-3500 Monday – Friday, 8:30AM – 5:00PM.